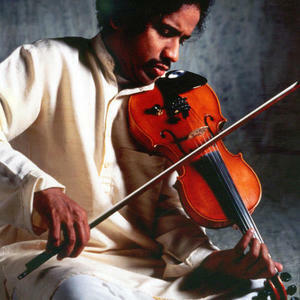 A gifted South Indian counterpart of Jean-Luc Ponty on the electric violin, and endlessly curious about all kinds of music, Subramaniam has been a pioneer in exploring intelligent fusions between European classical music, American jazz, rock, and South Indian music. His father, a master Indian violinist, and mother, who played the Indian veena, were his first musical influences, and after abandoning a career in medicine, he formed a violin trio with his two brothers while still in India. He toured America and Europe with Ravi Shankar and ex-Beatle George Harrison in 1974, made his first fusion album in Copenhagen (Garland), and wrote material for Stu Goldberg and Larry Coryell in 1978. He settled in the Los Angeles area in the late '70s in order to earn a doctorate in Western music at the California Institute of the Arts, where he also taught South Indian music. He led a group with Coryell, George Duke, and Tom Scott in the 1980s, and recorded several fascinating LPs for Milestone -- including an LP with Stephane Grappelli -- that fused classical music, electric and acoustic jazz, and South Indian music. Subramaniam has also written works for classical orchestras; his Violin Concerto juxtaposes na?ve Hollywood-ish romantic music with South Indian instruments and structures. His debut for the Erato Detour label, Global Fusion, followed in 1999.